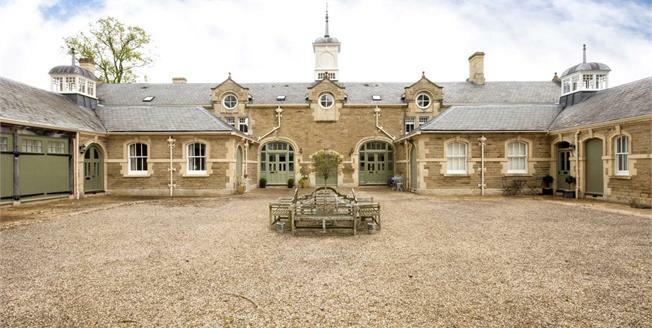 Originally built as the stable block to Audley House in the mid-1890's, this stunning Grade II listed building was converted into eight individual residences by Highland Court Homes who are renowned for quality conversions and refurbishment to a very high standard. This property sits in the beautiful grounds of Bruern Abbey. The accommodation is arranged on one level with enclosed entrance vestibule entering into an open plan kitchen living space with vaulted ceiling and useful mezzanine storage area. The kitchen has been fitted with solid oak units, granite work surfaces, porcelain sink and built in appliances. Many character features have been retained including cast iron radiators and sash windows. There is stylish oak flooring in the reception room and both bedrooms. The bathroom has been refitted by the current owner with a fully tiled double shower. Both bedrooms are double. There is access from the main living area into the rear garden. The pretty Cotswold stone village of Chesterton is approximately 10 miles north of Oxford and 2.5 miles south of Bicester. Within the village there are good local amenities including a new village hall, hotel and restaurant and The Red Cow Public House. On the outskirts of the village is Bicester Golf and Spa. The market town of Bicester has an array of amenities including cottage hospital, doctors surgeries, a selection of shops, restaurants, public houses, a new cinema, library and Bicester Village Shopping Outlet. The property is well placed for easy access to J9 of the M40. A regular train service to London/Marylebone leaves from Bicester North Mainline Station and also Bicester Village train station, approximately 2 miles distant. Chesterton Court is situated to the north of the vast grounds of Bruern Abbey School, a small preparatory school. The property is set in the beautiful grounds of Bruern Abbey School and approached by a tree lined driveway leading to the front courtyard and off road parking for the eight homes. There are two designated spaces and extra parking for guests. The main garden lies at the rear of the property which is lawned and enclosed by metal post and rail fencing. To the front of the coach house conversion is a shared courtyard with seating area. There is a Residents Management Company in place, approx £300 p.a.